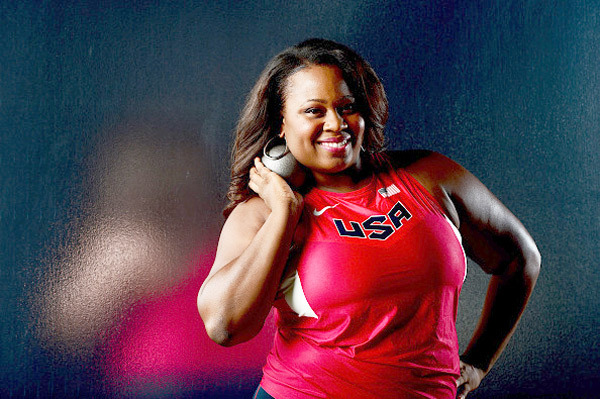 Michelle Carter (born October 12, 1985) is an American shot putter, and the current Olympic women’s champion. She is the current American record holder in the event with a distance of 20.63 m (67 ft 8 in) set at the 2016 Olympic Games. Carter won the 2016 gold medal at the Rio Olympics on the last of her six throws, edging two-time defending champion Valerie Adams of New Zealand. 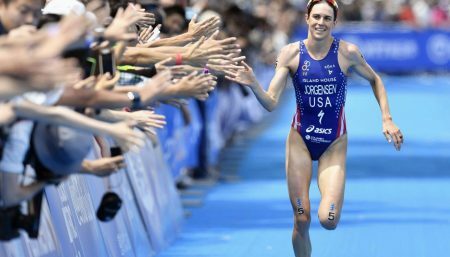 In doing so, Carter became the first United States women’s athlete to win the event since the women’s competition began at the 1948 Summer Olympic Games in London, England, and only the second American to win any medal (Earlene Brown, bronze medal, 1960). She also won the silver medal at the 2001 World Youth Championships and the gold medal at the 2004 World Junior Championships. She finished fifteenth at the 2008 Olympic Games and fifth at the 2012 Olympic Games. In addition to winning the 2008 United States Olympic Team Trials was the 2009, 2011 and 2014 National Champion. While competing for the University of Texas, she won the Collegiate National Championship in 2006. Carter is a graduate of Red Oak High School in the Red Oak, Texas. Her father, Michael Carter, is also a former Olympian and NFL star-the only athlete to win an Olympic medal and a Super Bowl ring in the same year. Both Michelle and her father hold the current National High School Record in the Shot Put, the only such father and daughter situation. Michelle set her record in 2003 while winning the Texas state championship, her father’s record has been unchallenged since 1979. After finishing as the runner-up at the 2012 Olympic Trials, Carter was presented her silver medal by gospel artist Kirk Franklin. Carter completed an epic double in 2013, capturing gold at the USA Indoor and USA Outdoor Championships. Carter is the national prep record-holder in the shot put at 16.73m/54-10.75, while her father, Michael, set the still-standing national boys prep record of 81-3.5 in 1979. She was a four-time Texas 4A state champion in the shot put, also set state record in the discus. A standout shot putter and NFL nose guard, Carter’s father Michael is the only person to win an Olympic medal and Super Bowl ring in the same year. He won three Super Bowl titles with the 49ers. She has one sister, D’Andra, who was a thrower at Texas Tech, and one brother, Michael, Jr.
Two-time Olympian, American Record Holder, 7-time USA Champion, and 2015 World Championship Bronze Medalist, Michelle Carter, has excelled at the national and international level of track and field for more than a decade. Michelle was also a stellar athlete in high school who won four back to back 4A track and field championships in the shot put and discus, garnering the state record in discus. Daughter of shot putter, 1984 Olympic Silver Medalist and San Francisco 49ers nose guard, Michael Carter was the national girls’ prep record-holder in the shot put at 16.73m/54-10.75. It was in 2013, broken by Raven Saunders. Her father, Michael, is still the standing national boys’ prep record of 81-3.5, set in 1979. Michael and Michelle Carter are the only father-daughter duo of their kind. Raised in Texas, Michelle Carter received a full track scholarship to The University of Texas, where she graduated in 2007 with a degree in Youth and Communities Studies, and a minor in Kinesiology. Making a name for herself, she has been featured in Essence Magazine, Dallas Morning News, ESPN, Network, ESPN The Magazine, NBC, The Sacramento Bee, Track and Field News in addition to many others. Michelle Carter is also a certified Professional Makeup Artist with a passion for beauty. 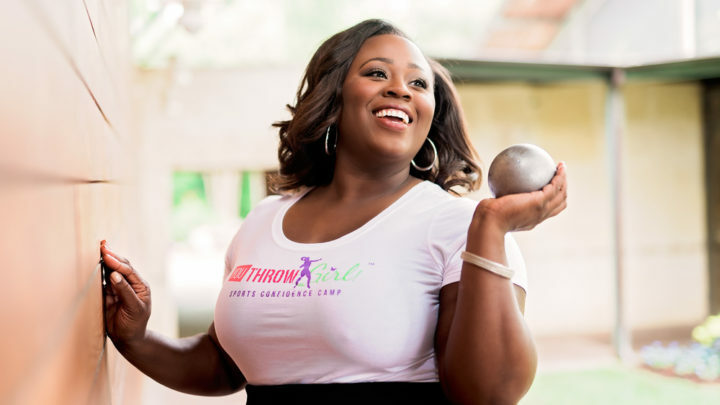 Michelle uniquely blends her passion for throwing and beauty, forming the name “ShotDiva”. Michelle is the founder of “You Throw Girl Sports Confidence Camp”, a sports camp that focuses on the complete female athlete through confidence building and athletic empowerment. As owner of Shot Diva’s Makeup, one of her favorite quotes is “When you look good…you feel good and you will do good”. She’s a firm believer in bringing beauty on the inside, out. Michelle has a passion for encouraging others to become all that they can be, to think outside the box, and surpass limitations. As one of her favorite scriptures, Philippians 4:13, states, “I can do ALL things through Christ who strengthens me.” Knowing where her strength comes from she is ready to face all obstacles that come her way.